At a reader's request, here is some information about one of the most famous violin concertos in Chinese music. The 1940s - 1950s was a period of great changes in China's modern history. With the end of the Second World War, the Chinese Civil War between the Chinese Communist Party and the Kuomintang resumed until finally in 1949 when the Kuomintang pulled out of the mainland and relocated to Taipei. Left in control of mainland China, the Communist Party of China proclaimed the formation of the People's Republic of China. A series of campaigns and plans shaped the newly formed People's Republic of China. First came the "Hundred Flowers Campaign" (百花运动) in which the citizens were encouraged to openly express their opinions of the communist regime and differing views and solutions to national policy were being encouraged. In line with this, artists were also encouraged to rethink traditional arts and music, to modernise the existing art and culture with new knowledge from the West, and at the same time, retain China's cultural and artistic characteristics. The economic and social plan known as the "Great Leap Forward" (大跃进) that followed aimed to transform the country from an agrarian economy into a communist society through rapid industrialisation and collectivisation unfortunately resulted in widespread famine. However, it not only changed the economical landscape but also the social landscape of the country. Religions and mystic institutions were abolished and being replaced with political meetings and propaganda sessions. There were also attempts to improve education in the rural areas and the status of women, as well as many feudalistic practices that were rampant in the past. From the 1950s up until the end of the Cultural Revolution, educated youths were also being "rusticated" or "sent down" to the countryside, either willingly or under coercion, under the assertion that "the countryside is a vast expanse of heaven and earth where we can flourish". "The Butterfly Lovers Concerto" grew out from this historical backdrop. Liu Pin (刘品), a secretary of the Communist Party's Oversight Branch who led a rusticating group which included the composer He Zhanhao to the countryside started the idea of composing a piece of music for the proletariats. Ideas of creating something which the masses could appreciate and enjoy was being thrown up. Instead of the violin being an instrument which plays only Western classical music, a genre which probably speaks to only a select group of elite, they wanted to create a piece of music for the violin which can speak to the masses. Hence an experimental group was being formed amongst these students. The composer He Zhanhao, having played the erhu in a yueju (越剧) troupe (a form of Chinese opera found around Shanghai), naturally took to the violin very quickly and was one of the more outstanding youths in the group. Hence in preparation for the 10th anniversary of the formation of the People's Republic of China, when a gift was being suggested to commemorate this occasion, he was being asked to compose a large scale piece of music in accordance with these ideals. Being inexperienced in composition, He Zhanhao found himself in a fix. Even though he was motivated and interested in writing something, he found that he did not know where to start. It was only until after the encouragement of Liu Pin, who reminded him that he had plenty of music within himself, all the music from the operas that he was so familiar with was there, that He Zhanhao realised where he could draw his inspiration from. With this plan underway, Liu Pin explained the situation to the assistant head of the Shanghai Conservatory of music Ding Shan De (丁善德) who then roped one of the composition students of the conservatory, Chen Gang, into the composition group. As told by He Zhanhao on the 50th anniversary of this composition, the names being put up as composers for this piece of music was decided by the leaders, with He Zhanhao as the first composer and Chen Gang as the second. However, there were also other people who were instrumental in the creation of this piece of work whose names were not being mentioned, such as Ding Zhi Nuo (丁芷诺), the daughter of Ding Shan De. "The Butterfly Lovers Concerto" is a single-movement work in sonata form. Based upon the legend of "The Butterfly Lovers", the piece is divided into 3 main sections, corresponding also to the sections within the sonata form, the exposition; development; and recapitulation. Explaining how they worked together in the compositional process, He Zhanhao said that he would first write down the solo violin melody in sections and bring to Chen Gang. Being a composition student and well-versed in arranging for an orchestra and accompanying instruments, Chen Gang would look through the melodies and when they were both satisfied with the melody, orchestrate it. for example, is an interlude which is often found in yueju. is also another interlude used in many different places in yueju. Operatic techniques of "jin da man chang" (紧打慢唱), in which the percussion and accompanying instruments play a regular, usually fast and intense rhythm while the melodic instruments (singing or solo instrument) play a slower, rhythmically free melody, are also being utilised. 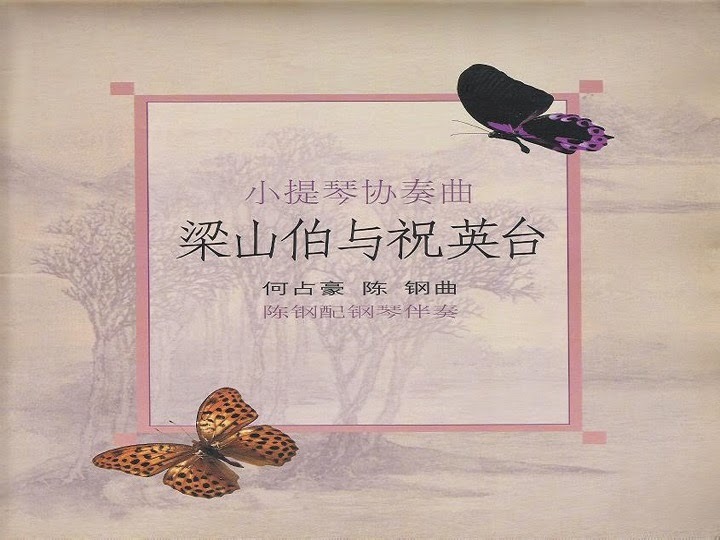 Finally in 27 May 1959, this pioneering work in Chinese music, "The Butterfly Lovers Concerto" was being premiered in Shanghai by the violinist Yu Li Na (俞丽拿). In combining Western instruments and forms with Chinese sounds and ideas, it reflected the ideals the Chinese had at that time, to absorb new ideas from the West and at the same time, to retain their own characteristics. Wildly popular since the first performance, this concerto has since been transcribed for many other different instruments and also for a Chinese orchestra. Chen Ming Zhi ed. Zhong Yue Yin Nin Geng Dong Ting - Min Zu Guan Xian Yue Dao Shang (Vol 2). "中樂因您更動聽－民族管弦樂導賞(下冊). Hong Kong: San Lian Shu Dian, 2003.